Q.T. 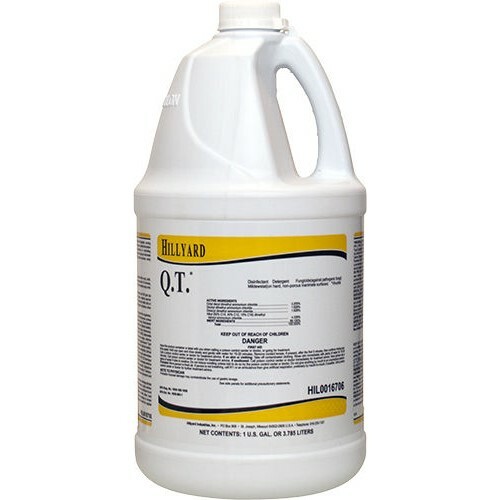 is a concentrated, hospital grade disinfectant, detergent, cleaner, fungicide, mildewstat, virucide, deodorizer that cleans and controls the hazard of cross contamination from environmental surfaces. One gallon makes 129 gallons of broad spectrum disinfectant per detergent. Q.T. has a neutral pH formula that makes it perfect for cleaning floors without damaging floor finishes. And since it is approved for mechanical spraying, Q.T. is ideal for cleaning and disinfecting restrooms and showers using a coarse spray trigger sprayer, pump up sprayer, or foam gun. Q.T. is effective against hepatitis B and C Viruses. It has controls odor causing organisms and leaves a pleasant herbal fragrance that leaves surfaces smelling clean and sanitary with a light scent of the outdoors. Dilution rate 1 oz per gallon. Controls cross-contamination from environmental surfaces.